365 days of wonderful: Ladder Safety? •Place your ladder on a stable, even, flat surface. Never place a ladder on top of another object -Yes, it's on a flat surface, how much flatter can you get than a wall? •Never leave ladders unattended - kids love them... I have a small sign posted that says "unattended children will be eaten" so that should cover that! I found this old wooden ladder at a barn sale when I was visiting my sister up near Tweed, she lives on a farm in the country. I think I paid about $15 for it. 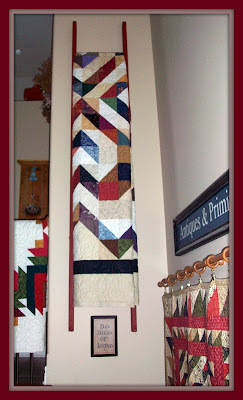 Brought it home, painted it barn red and found the perfect place to hang it and one of my favorite quilts. I like the idea of a ladder to put the quilts on. Hint to my husband coming. Love your quilts.